Its cool they added a couple new levels and characters since the first release, but I was really hoping there'd be entirely new worlds/episodes by now. Also, the trailer shows how much they've improved. Also also, Duke Nukem and Bombshell are finally in a game together after like 20+ years. As well as Duke and Wang, even if it's the neutered version of Wang - I always thought they should be a "couple". Agreed about the lack of new worlds, I guess they blew the budget on fancy graphics like with Bombshell. 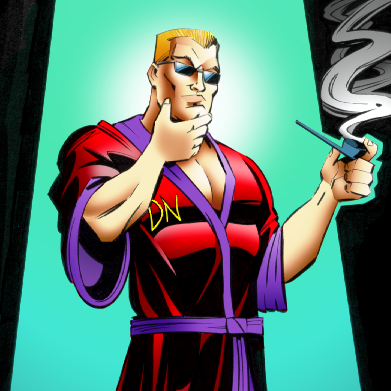 Duke Nukem, the Hunchback of Notre Dame! It's cool to know that Duke has magnetic jeans to hold the Desert Eagle in place though. Hey, that HUD looks pretty cool. It's a mod but It's neither Garry's Mod nor is it fucked. It's actually cool to start Hollywood Holocaust with Duke in his spaceship and havin an Assault with EDF-Troopers next to the cinema ... and I was really suprised to free Shelly from the fist cell in Death Row and have her help you. Yes, the mod is rough around the edges (but get's polished still) ... but I had a lot of fun with it already (... after talkking to 3DR they said it is better not to link to it and let it "fly under the radar"). And to me putting other characters in a new version of a completely different game (Rad Rodgers this time instead of Bulletstorm) is nothing more than a mod ... but made by empoyees. I also enjoy the steotopygia. Baby's got back. Does he even have a face? You can hardly tell. looks like poo. is the switch that bad?